An NPR "Staff Pick" and One of the NPR Book Concierge's"Best Books of the Year"
When Sara Zaske moved from Oregon to Berlin with her husband and toddler, she knew the transition would be challenging, especially when she became pregnant with her second child. She was surprised to discover that German parents give their children a great deal of freedom—much more than Americans. In Berlin, kids walk to school by themselves, ride the subway alone, cut food with sharp knives, and even play with fire. German parents did not share her fears, and their children were thriving. Was she doing the opposite of what she intended, which was to raise capable children? Why was parenting culture so different in the States? Through her own family’s often funny experiences as well as interviews with other parents, teachers, and experts, Zaske shares the many unexpected parenting lessons she learned from living in Germany. 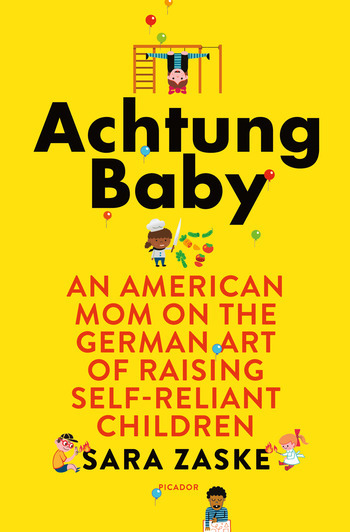 Achtung Baby reveals that today's Germans know something that American parents don't (or have perhaps forgotten) about raising kids with “selbstandigkeit” (self-reliance), and provides practical examples American parents can use to give their own children the freedom they need to grow into responsible, independent adults. “This is a beautiful book. Zaske uses her personal experience raising her children in Berlin to reveal the differences—fundamental and trivial, serious and humorous—between German and American parenting, finding lessons in the ways Germans rear their children from birth to adolescence. Zaske probes our cultural differences and mines the hard data to offer us her pungent observations. Her insights deserve our attention.” —Robert LeVine, author of Do Parents Matter? SARA ZASKE is an American writer who lived in Berlin for six and a half years. Her articles on her family's experiences in Germany have appeared on Time.com, in The New York Times, The Wall Street Journal, and Bild am Sontag, Germany's largest Sunday paper. She lives in Idaho with her husband and two children.